It has been a long time since I have been able to post, so I apologize to my regular readers. Between needing surgery and several work trips, I have been unable to find hobby time. Last night marked the first time in nearly a year since I was able to do anything hobby related. 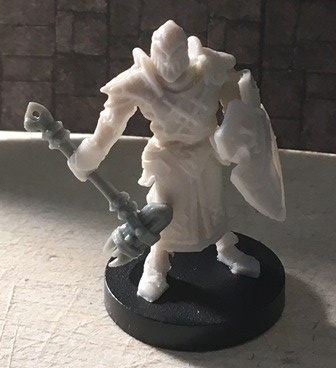 Vernone by Reaper Miniatures in Bones. Sadly miscast. Conversion of Vernone by Reaper Miniatures in Bones. The first thing I did was a bit of a conversion. 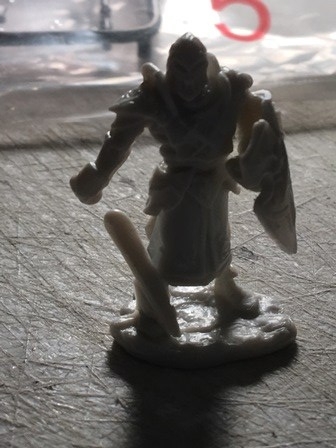 When my Bones 3 arrived, I had one miscast model, Vernone. I contacted Reaper and they quickly sent me a replacement. In the mean-time, he had been sitting on my desk when I came back. A bit of scalpel work later and viola, a new knight with a grim hammer. Nothing too involved but a good selling point of Bones: this conversion would be much more difficult in nearly all other materials. In keeping with my bad puns, like Return of the Jedi, this post will feature a cute and cuddly thing too. Well maybe just cute. 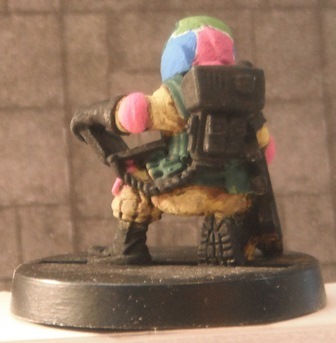 One of the space rogues (think Guardians of the Galaxy) I have been working on, I did the basic blocking out of colours for Ruth last night, the plucky space dwarf (Hasslefree Grimm) hacker. 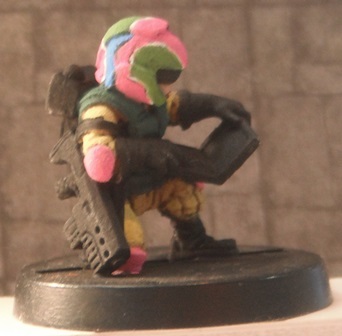 I wanted an eclectic colour mix for the helmet and did some lines to divide and pushed paint around. Her bright yellow jumpsuit screams non-combatant and I figured it was funny. 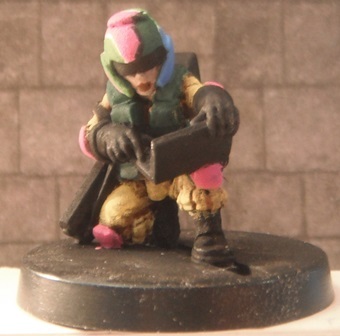 I had to make her elbow and knee pads pink just to add to the whole ludicrous effect. I see with the giants pics of shame that I need to touch up a few edges and I need a bit better blending of her jumpsuit in a couple spots. 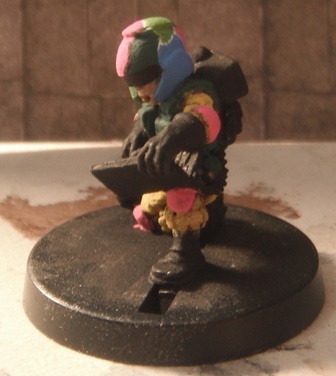 I still need to highlight the webbing, helmet, visor and finish a few things but I think the overall effect is cool and evokes the stereo-typical free-spirit hacker. 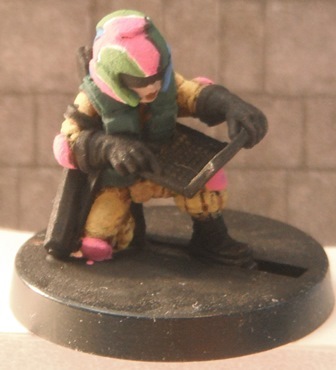 The laptop is likely going to stay black or grey but I intend to paint on some logos on the back of the screen and possibly add in either the “blue screen of death”, a start-up screen from Windows, or a busy looking screen making it look like she is doing some hard-core hacking. Still, as a WIP and only a bit of brush time she is definitely coming along. I do like the look of the Grimm and I am not sure what I would paint the others when I pick more up. 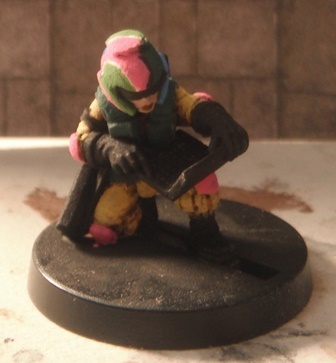 I am tempted to keep the yellow jumpsuits but have everything “military” painted in olive drab or something similar. When I pick some more of them up we will see where my head is at. So from the obscurity of the web comes a quick update. Hopefully you found this inspirational, if nothing else to dive back in with both feet after a hobby hiatus.